Nanyang Outstanding Young Alumni Award 2015 Chester Tan. Photo by Daniel Ding. 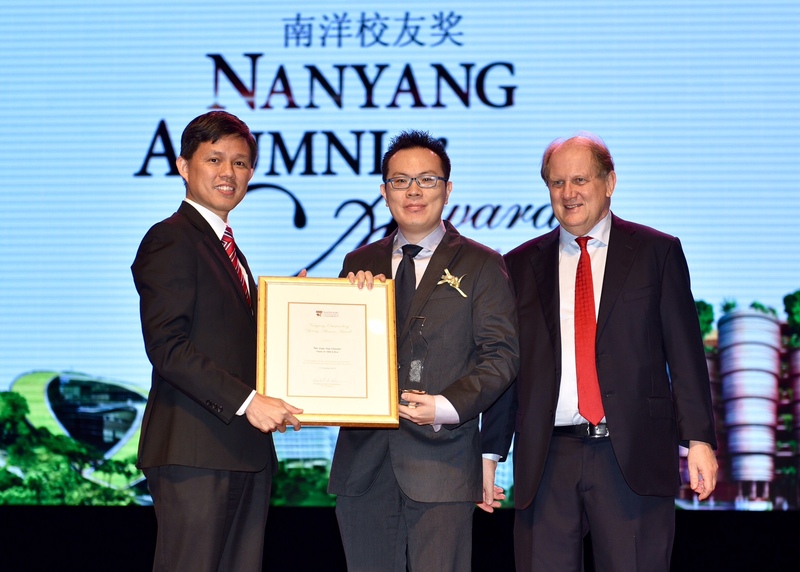 On Saturday 17 Oct 2015, NTU presented me with the Nanyang Outstanding Young Alumni Award. The award “recognises alumni, under the ages of 40, whose endeavours in their chosen fields or professions are worthy of recognition and have brought honour to the University.” For my case, I am receiving this award for my award-winning music career and contributions to the Singapore music scene. This year, 8 awardees were given for this category. It has been 16 years since I graduated from NTU, and the campus has transformed so much, yet I was glad that a lot of the buildings and landmarks remain unchanged, allowing much nostalgic feelings to return to me. Come to think of it, 16 years is just about the length of time it takes to study from Primary to University. Looking at the progress over the past decade, I look forward to the next decade of changes, hopefully in time for my daughter to enrol! The Nanyang Alumni Awards ceremony was made special this year with the special segment to honour the NTU pioneer educators, plus appearances of several music and arts personality, namely Ling Kai as the MC, Stefanie Sun as the guest performer (her father was one of the pioneer educators receiving award) and the master guitarist Daniel Chai whom I have personally met in COMPASS Awards 2014. Joanne Peh was also at the event to receive the Nanyang Alumni Achievement Award. I am deeply honoured to receive this prestigious recognition, and appreciate the great effort put in by the NTU Alumni Affairs Office staff to make sure the awardees are well taken care of. Many thanks to Ann Ong and Jennifer Su for their hospitality. Thank you to friends who posted their congratulatory messages on my Facebook page. Very grateful for your support in my music creation since 1996. Most importantly, I thank my family for the inspiration and patience to my humble music career.